The Pacific War is an uncomfortable subject for me. I don’t like war, and I don’t like watching movies about war, and I don’t like reading about war – especially the Pacific War. I’m also not entirely comfortable recommending a book written about the Pacific War. However, a friend of mine recently confided in me that he’s working on a novel about a Japanese soldier on a small island in the Pacific. The novel would have swords, he told me, and survival, and brilliant military strategies, and cherry blossoms. At the end of his novel, everyone would die a glorious and noble death. I told my friend to go read Fires on the Plain. Fires on the Plain is about a soldier named Tamura who is stationed on Leyte, an island in the Philippines. Ōoka himself was drafted and sent to Leyte in 1944, so one can plausibly assume that the novel is somewhat based on the author’s experiences. What distinguishes Fires on the Plain from many other Japanese fictional accounts of the war, however, is that it is not written in the style of proletarian literature or the semi-autobiographical shishōsetsu (“I-novels). Before he was drafted, Ōoka worked at a Franco-Japanese translation agency while working on his own translations of French literature. Far from being preachy or moralistic, Fires on the Plain is a tightly structured psychological novel written in the style of nineteenth-century French novelists such as Stendhal, Ōoka’s favorite author. Fires on the Plain focuses on the psychological and emotional struggles of Tamura as the soldier is kicked out of his unit, sets off on his own, later rejoins the scattered remnants of the Japanese army still on the island, and then struggles for survival in the company of two men who have turned to cannibalism in order to stay alive. During his time on Leyte, Tamura ponders the nature of humanity, the relationship between God and man, and the workings of free will in the face of an almost certain fate. His primary concern, and the primary concern of every character that appears in the novel, however, is hunger. How long can you live on a handful of potatoes? How can you procure food from the native islanders without getting killed? Where can you find salt? What do you do after all the food is gone? Aside from the ranting of one half-dead and half-crazed man who appears towards the end of the novel, the glory of the Emperor and the nation of Japan have no place in the consciousness of Tamura and his fellow soldiers. The sun gleamed on the river’s surface, and clouds scudded across the dazzling sky to disappear over the mountain peaks. On the sloping banks of the river bamboos grew luxuriantly, their green leaves wafted by the breeze. Driftwood, which remains from the floods of the rainy season, lay drying on the sand and pebbles of the river’s edge. Now and then the water would strike the banks capriciously, or form deep pools, or spread out into frothy rapids. In the evenings by the shadows of the pools I could hear the river deer cry as they came down to drink, and at dawn the turtledoves cooed high on the river bank. How could I have failed to notice the objects lying at the foot of those steps – objects that must have been in my field of vision for some time? My sense of perception must have already changed during the weeks since I had left my company. Clearly the link between my consciousness and the outer world was greatly attenuated. A solitary alien in an enemy land, I had by this time come to notice only objects that warned me of immediate danger, or, as in this case, objects on which I literally stumbled. I thought of them as “objects” though some might call them “people.” In one sense, to be sure, they were people, but their bodies had already become dehumanized objects. What lay below those steps were corpses. Having been corpses for some time, they had lost all the individual conformations of their past lives. Only their army trousers revealed some slight trace of the time when their owners had belonged to humankind; yet even these were so discolored by mud and carrion slime that they no longer seemed like human clothing and were, indeed, barely distinguishable from the surrounding earth. In the end, though, having been abandoned on Leyte and left to fend for himself during the closing days of the Pacific War, and having witnessed death and killed people himself, and having starved and eaten the flesh of his fellow soldiers, Tamura is no closer to solving the great mysteries of life than he was when at the beginning of the novel. The confusion of the narrator becomes the confusion of the reader; and, despite its brilliant imagery and powerful symbolism, it is difficult to draw any clear philosophical message from the novel – besides the painfully obvious. Anyone interested in the Pacific War in any capacity should read Fires on the Plain. 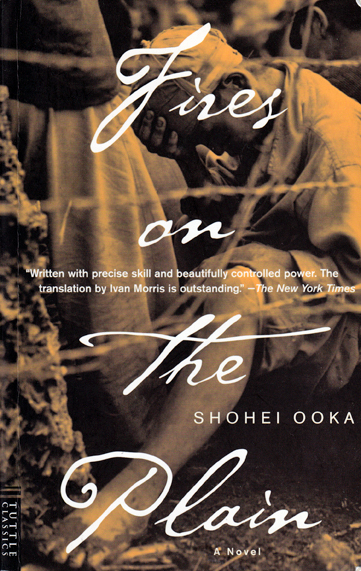 Ōoka demonstrates that the reality of the war was anything but honorable and glorious, but he does so through the vehicle of a disturbing yet highly readable novel that feels no need to shove its “war is evil” message into the reader’s face. Timely. I keep recommending you to my class blog (http://jpn400.wordpress.com/) and we will take up _Fires on the Plain_ next week. Great stuff here! This is a bit of a far-fetched connection to make between one topic and another, but have you read the new translation of Mizuki Shigeru’s Onward Towards Our Noble Deaths? I think it’s a really good companion piece for Fires on the Plain. Although of course Letters from Iwojima is as well – I would really like to try that combination in a future class. This was one of the first works of Japanese literature that I read that affected me on a pretty deep level. I ended up focusing on another novel, Okuizumi Hikaru’s Ishi no raireki (translated beautifully by James Westerhoven as The Stones Cry Out) for my dissertation. Okuizumi admits to being heavily influenced by Ooka, and The Stones Cry Out includes a lot of memories of being a starving soldier in the Philippines, and becoming unable to distinguish reality from fantasy. Both really powerful books. The Stones Cry Out is a fantastic book. Really, it is. I think it’s actually one of the best books I’ve ever read, Japanese or otherwise. It’s so chilling, and so sad. I just put it on this blog’s “Reading List” – I don’t know why it wasn’t up there before. Thank you! This is one of my favorite books. As is The Stones Cry Out (way moreso – that is really one of my favorites!) as someone has mentioned above. Thank you for writing about it.